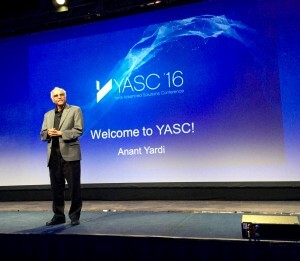 In a speech focused on goals and giving back, Yardi CEO and founder Anant Yardi addressed the 1300 attendees of the 2016 Spring Yardi Advanced Solutions Conference in Washington, DC on Wednesday morning. Speaking to the clients across a variety of real estate verticals, Mr. Yardi talked about the company’s focus for the future: app-based technology that will enhance ease of use and push real estate software toward a model similar to Uber and Airbnb. “Our focus from here onwards will be mobile apps,” Mr. Yardi said. He demonstrated how apps already play a significant role for Yardi multifamily clients. Renters using the RENTCafé Resident app have submitted thousands of work orders, which are processed using Yardi Maintenance mobile apps for property and maintenance managers. Additional apps for leasing, facilities management, and electronic health care record-keeping are already in use by Yardi clients. Mr. Yardi forecast that in the near future, apps will allow users to quickly and easily interface with their cloud-based Voyager platforms. 95 percent of Yardi clients are now cloud-hosted, he said. “That’s one of our goals – just one segment of our next pentathlon,” Mr. Yardi said. The general session opened with a video showcasing the marketing genius of pentathlete Mia Wentworth, Director of Marketing and Training at Monarch Investment and Management. Her focus on creating a “culture of achievement” at her company inspired Yardi’s remarks on bringing value to clients and breaking new ground. He shared that the company has been making community donations for the last 15 years. That effort recently expanded to a focus on climate change and environmental protection, with funding of education and advocacy programs from IREM, BOMA, and NAA. “30 percent of all electricity used in the US is by commercial buildings. We know this can be reduced by 10 to 15 percent,” Mr. Yardi said. The company’s energy suite of products and advocacy efforts are both working toward that goal. A third facet of the company’s giving is focused on the underprivileged and those in crisis. The session concluded with a moving video that showcased how a Yardi team recently built a portal to assist victims of the Fort McMurray wildfire in Canada in just 72 hours time.